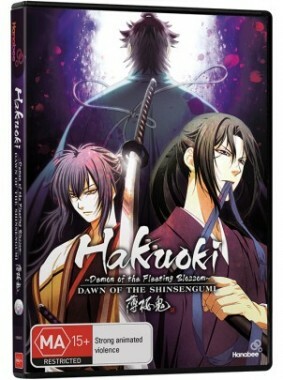 Hakuoki – Demon of the Fleeting Blossom – has had a great deal of releases in the past, it started out as an “Otome” game title and only recently, in the past few years, has it become an actual Anime series that is now in it’s third season which, while I’m not too into what this title has to lay down, it seems as though a lot of people are. I reviewed one of the seasons that came before this one (you can read it here) which had a great deal of the “Otome” element, this one however seems to have cut that right out and it allowed me to enjoy it more than the last season despite it having flaws. Read on to get the full impression of what I felt about this release. 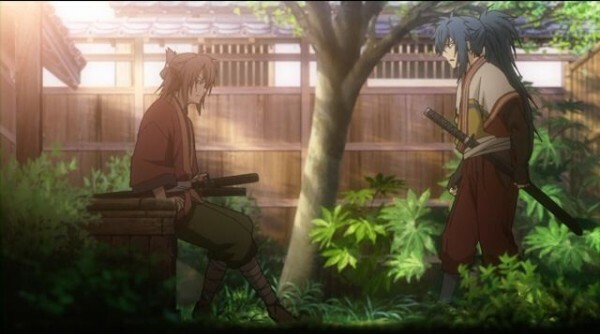 Hakuoki – Demon of the Fleeting Blossom- Dawn of Shinsengumi seems to take us back a bit to where it all began and by “it all” I mean the Shinsengumi. While it is a prequel to the other seasons the characters haven’t really changed from this time to the time we see them in the future which is…poor to say the least. Ryunosuke Ibuki is, seemingly, the main character of the series along side the usual rag-tag cast that we’ve seen in every other Hakuoki iteration. 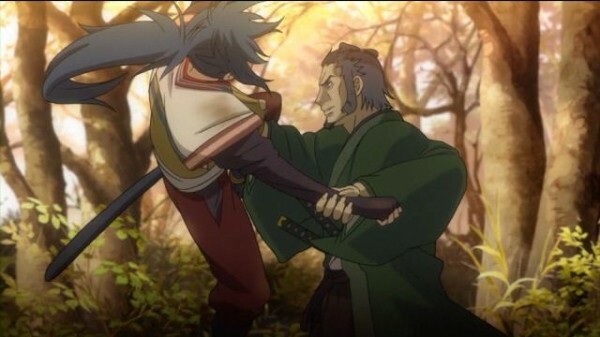 Ibuki is the son of a great Samurai who is made a slave by a man named Serizawa who saved him, he’s then taken back to a compound where he meets the “Hakuoki crew”, as I’m calling them, and that is where the series truly begins. 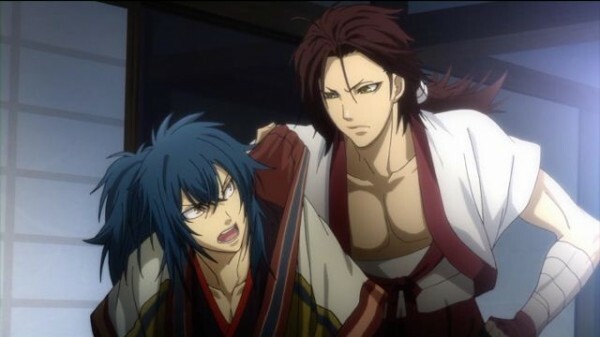 Now without getting into the “nitty gritty” of the story what we see is, basically, the rise and fall of the Shinsengumi. You can, somewhat, imaging what the story is going to be like and if you are imagining something right now chances are you are correct for the most part. While the first half of the 12-episode series is pretty basic with it’s “the citizens of this town hate us” and it’s “you don’t respect what we’re doing to help”, the second half of the series takes a fantastic turn with a supernatural, almost scientific aspect coming into play. 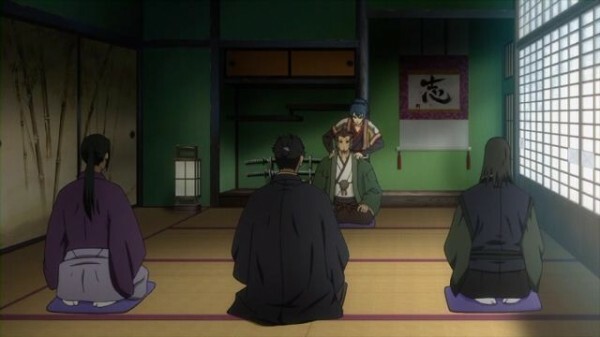 It is in the second half of “Dawn of the Shinsengumi” where you really see some character development as well as some story development and, I’d say, it’s actually worth sitting through the monotonous scenes. Usually with titles like this I have no problem spoiling certain aspects of the story but, this time around, I’m NOT going to do that because the series actually gets great, the only unfortunate thing about it is that it takes almost 9 of 12 episodes to kick in which is where the problem lies. 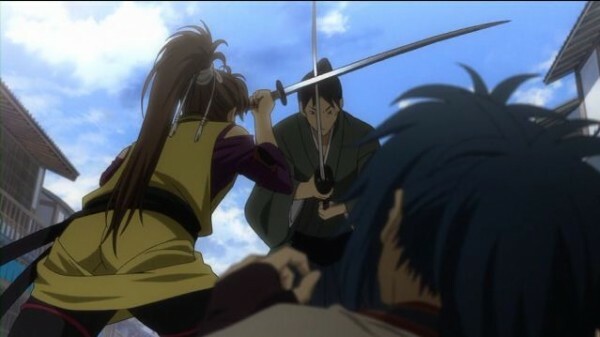 I understand that there must be a lead up to certain events but, in my opinion, a lot of what “Dawn of the Shinsengumi” had to offer could’ve been breezed past and paced better, that’s not to say it was entirely bad at all, it simply could have been done better. Character don’t seem to actually interact well, they were written quirky but not quirky enough for it to be bearable, in fact, the best interaction come from the most crucial parts of the story which backs up my point of sitting through the bad to get to the good. I’m glad that they decided to kick the “Otome” aspect of the series, even just for this release, because it helped me get into the series and not cringe at every moment. One thing that is does well is end and that’s not me being clever or rude, it actually has a great ending which sets up the series’ that came before this one’s release. I like it when a series does this kind of thing right and it seems to make up for a great deal of what the rest of the title lacks. It is definitely a series that, if you intend to watch it, you have to watch the whole thing then decide whether or not you’re a fan because it really makes an impact after the viewing rather than through it, now I’m not a big fan of that because I believe an Anime should have you hooked from start to end but I do respect an Anime where the end makes up for the beginning so I can’t really come down hard on Hakuoki too much. I’m sorry to say but it seems fairly dated even though I don’t think it physically is an old Anime. Visually the series is the same as it is story-wise; the further the Anime goes on, the better the animation gets. At the beginning I wasn’t impressed at all, to me it just seemed like another generic release which we’ve seen a lot when it comes to game-to-anime releases but it’s not that at all. By the end of the series I was really impressed at the calibre of the fight scenes that we see and the style of it all, it’s extremely “Samurai-ey”; blades shine and glisten while the blood is dark red and almost seems to glow around the borders and it makes for some very cinematic struggles and battles. Costume-wise I think it was done very well! 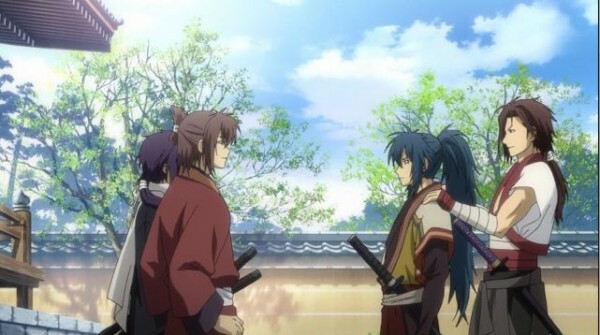 While the regular hakuoki crew’s costumes hadn’t changed at all, the actual Shinsengumi jackets were incredibly historically accurate which I thought was a fantastic touch. If you’re a fan of Samurai-titles like I am, the Shinsengumi jacket is an extremely icon image so I really enjoyed seeing it once again. As always the environments looked exceptional and just complemented the rest of the series aesthetically. I’m going to start with something negative because it was the an aspect of the audio that stood out the most; the voice acting. I’m sorry to say but the voice acting was an aggressive average for about 90% of the series. The characters all seemed boring and childish, it just doesn’t work when you’re given a team of highly-trained Samurai and you’re meant to believe that is what they are. They did a great job during the final scenes of the series with a great deal of intense screaming and, actually, the Geisha who popped up a fair bit throughout the series wasn’t annoying at all, she was probably the least aggravating of them all. I highly suggest watching it in Japanese because it is the original language and it fits a lot better considering the series is set in ancient Japan. I’ve heard these particular voice actors in many other Anime titles and they’re not bad at all it just so happens that these are the characters they must play and it really didn’t come across as well as it could’ve. The music was great, very traditional, very accurate and very suiting indeed. I’ll give credit when credit is due; the music was, audio-wise, the best aspect. This release didn’t really come with any extras apart from the usual trailers and what not. It does have a nice piece of art on the flip-side of the DVD cover but apart from that there was nothing much else which, as always, seems to be the norm for Anime releases so it really isn’t that disappointing. It is a very good release and, yes, it has it’s flaws but what Anime doesn’t? Fact is; it was great, it wasn’t too boring and the parts that were got better as you watched on. It’s not for everyone, that’s something I can say with certainty, it takes a good fan of the series or of Samurai-stories to enjoy this release but I wouldn’t pass it up if you are a fan of those things. While it’s not a perfect release and it could’ve been done better I also wouldn’t say it was a terrible release.